(MATTERLEY BASIN) Great Britain, 29 September 2017 - The biggest and best motocross event of 2017 is here! The Monster Energy FIM Motocross of Nations presented by Fiat Professional will host the best riders in the world all competing for their country’s glory. 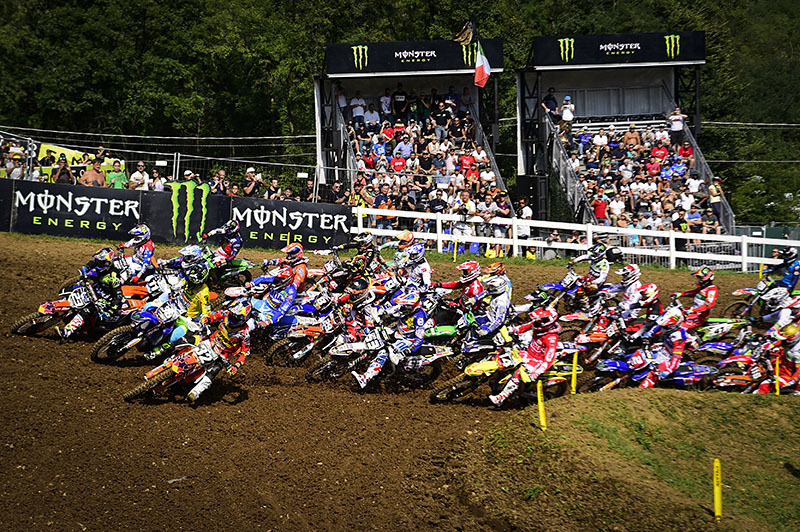 With 39 nations from around the world participating at the famous Matterley Basin circuit in front of tens of thousands of motocross fans it will be an epic race weekend not to miss. The 2017 Monster Energy FIM Motocross of Nations presented by Fiat Professional will receive television coverage from MXGP’s traditional partners. The event will also be available LIVE to everyone worldwide from the UK on MXGP-TV.com Friday, Saturday, and Sunday. Friday’s MXGP Awards and Team’s Presentation are added to this year’s offering on both Facebook Live and MXGP-TV.com plus the same can be said for Saturday morning’s Balloting and Live Studio Show. Plus you can watch the 26min Behind the Gate in Europe on motorsport.tv & MotorTrend two days after the event. It can also be viewed in the USA/Canada on BeIn and MAV TV, Finland on MTV 3, Croatia on Kreator TV, South America on FOX Sports, Asia on FOX Sports, China on Fox Sports and SINA, and the Middle East and Africa on BeIn.